Once among the most prominent of Mali’s many ethnic groups, the Songhoy now live largely on the margins of the West African nation. Nonetheless, the Songhoy people retain a fierce pride in their history, beliefs, and traditional music. Hailing from the heart of Gao, on the banks of the Niger River, Oumar Touré and Aliou Touré grew up obsessed with hip hop, R&B, and classic rock like The Beatles and Jimi Hendrix. They found a kindred spirit and musical brother in guitarist Garba Touré (son of Oumar Touré, long term percussionist in Ali Farka Touré’s band). 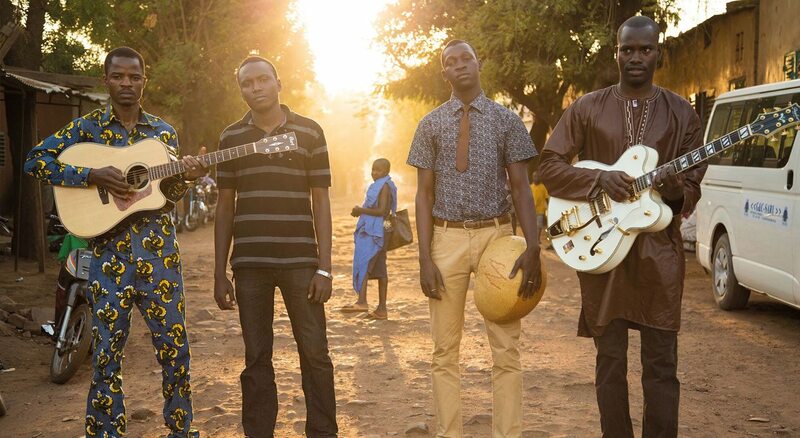 When growing unrest in the north of Mali forced the young men and their families to take refuge in the southern town of Bamako, they decided to turn crisis into opportunity by forming a band. They enlisted drummer Nathanial “Nat” Dembele and baptized their band Songhoy Blues in celebration of their displaced people and culture.